James "Jimmy" Stewart (1908-1997) was a popular actor for a good deal of the 20th century, starring in films from Harvey to The Philadelphia Story to The Man Who Shot Liberty Valance. He is perhaps most famous for his role as George Bailey in the classic film It's a Wonderful Life, with Mr. Smith Goes to Washington getting a strong look-in. His other films included You Can't Take It with You, The Shop Around the Corner, Anatomy of a Murder, and The Flight of the Phoenix, as well as numerous Westerns (including Destry Rides Again, Winchester '73, How the West Was Won, and Shenandoah) and Biopics (including The Glenn Miller Story and The Spirit of St. Louis), and four films with Alfred Hitchcock (Rope, Rear Window, The Man Who Knew Too Much, and Vertigo). 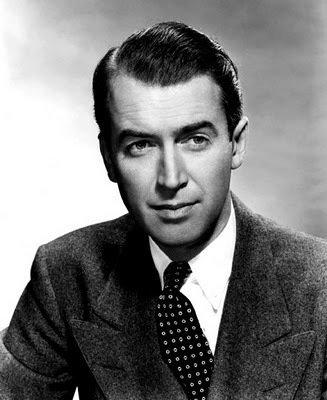 A mark of his image as an everyman was his constantly being referred to by the public (and this entry) as "Jimmy Stewart", despite the fact that he was never credited as such in any of his famous film roles, always going by "James". As a young man he attended Princeton University, and got his first taste of show business in the Princeton Triangle Club. He fought as a pilot and commander in the Second World War and flew once as a non-duty observer in a B-52 on a bombing mission during the Vietnam War (eventually promoted to the rank of Brigadier General in the Air Force Reserves, starting from private), and was famous for being a Nice Guy, both in his film roles and in real life. He had a very unusual speaking voice that is somewhat hard to describe (a sort of quasi-hesitation/stutter), and even harder to imitate. Also known for reading poems he wrote about his dog on talk shows in his later years. This page was last edited on 19 January 2019, at 21:00.